Citycat travelers will have noticed a brand new ferry terminal downstream along the Brisbane River. As you step off the ferry at Northshore Hamilton, a splash or two from The Gateway Bridge, you arrive in a riverside "playscape." 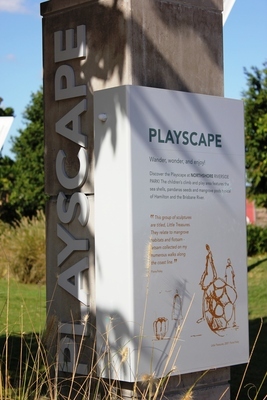 A "playscape" is a landscape that you play in - a modern playground designed to blend with the environment yet encourage interaction. 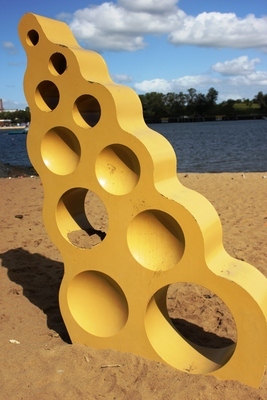 This playscape incorporates the river theme with shell shapes resting on the beach, giant silver pandanus seeds to scamper over and salvaged wharf timbers on display. 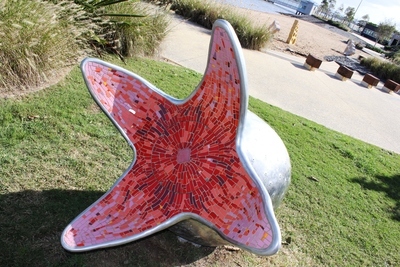 Indigenous artist, Fiona Foley sculpted the collection entitled, "Little Treasures", inspired by mangrove habitats and coastal flotsam and jetsom. The entire area is fun to explore and a refreshing spot to take a BBQ or picnic. Northshore Riverside Cafe offers another tempting dining option. 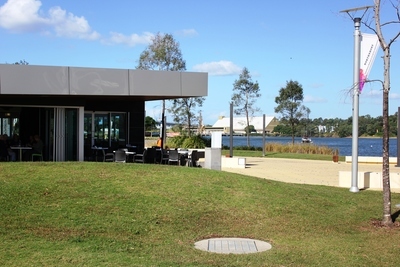 This breezy cafe directly overlooks the river and is worth the ferry trip alone. They also serve take away coffee, drinks and snacks. 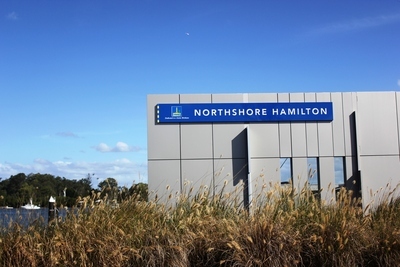 Northshore Hamilton is part of Brisbane's Urban Renewal Project, incorporating 2 kilometres of riverfront, with plans to house an amazing 15 000 people. It will be interesting to see how the transformation unfolds and I reckon this is a special place to add to your list of sights to show visitors to Brisbane.